"Tamal" redirects here. For the town in Ghana, see Tamale, Ghana. For other uses, see Tamal (disambiguation). A tamale (Spanish: tamal, Nahuatl languages: tamalli) is a traditional Mesoamerican dish made of masa or dough (starchy, and usually corn-based), which is steamed in a corn husk or banana leaf. The wrapping can either be discarded prior to eating, or be used as a plate, the tamale eaten from within. Tamales can be filled with meats, cheeses, fruits, vegetables, chilies or any preparation according to taste, and both the filling and the cooking liquid may be seasoned. The preparation of tamales is likely to have spread from the indigenous culture in Mexico and Guatemala to the rest of Latin America. According to archaeologists Karl Taube, William Saturn and David Stuart, tamales may date from the year 100 AD. They found pictorial references in the Mural of San Bartolo, in Petén, Guatemala. The Aztec and Maya civilizations, as well as the Olmec and Toltec before them, used tamales as easily portable food, for hunting trips, and for traveling large distances, as well as supporting their armies. Tamales were also considered sacred as it is the food of the gods. Aztec, Maya, Olmeca, and Tolteca all considered themselves to be people of corn and so tamales played a large part in their rituals and festivals. "Tamale" comes from the Nahuatl word tamalli (meaning "wrapped") via Spanish where the singular is tamal and the plural tamales. The word "tamale" is a back-formation of tamales, with English speakers assuming the singular was "tamale" and the plural "tamales." In the pre-Columbian era, the Aztecs ate tamales with these ingredients: turkey, flamingo, frog, axolotl, pocket gopher, rabbit, fish, turkey eggs, honey, fruits, squash and beans, as well as with no filling. Aztec tamales differed from modern tamales by not having added fat. One of the most significant rituals for the Aztecs was the feast of Atamalcualiztli (eating of water tamales). This ritual, held every eight years for a whole week, was done by eating tamales without any seasoning, spices, or filling which allowed the maize freedom from being overworked in the usual tamale cooking methods. In the pre-Columbian era, the Mayas ate tamales and often served them at feasts and festivals. The Classic Maya hieroglyph for tamales has been identified on pots and other objects dating back to the Classic Era (200–1000 CE), although it is likely they were eaten much earlier. While tortillas are the basis for the contemporary Maya diet, there is remarkably little evidence for tortilla production among the Classic period Maya. A lack of griddles in the archaeological record suggest that the primary foodstuff of the Mesoamerican diet may have been the tamale, a cooked, vegetal-wrapped mass of maize dough. Tamales are cooked without the use of ceramic technologies and are therefore the form of the tamale is thought to predate the tortilla. Similarities between the two maize products can be found in both the ingredients and preparation techniques and the linguistic ambiguity exhibited by the pan-Mayan term wa referring to a basic, daily consumed maize product that can refer to either tortillas or tamales. In Mexico, tamales begin with a dough made from nixtamalized corn (hominy), called masa, or a masa mix, such as Maseca, and lard or vegetable shortening. Tamales are generally wrapped in corn husks or plantain leaves before being steamed, depending on the region from which they come. They usually have a sweet or savory filling and are usually steamed until firm. Tamale-making is a ritual that has been part of Mexican life since pre-Hispanic times, when special fillings and forms were designated for each specific festival or life event. Today, tamales are typically filled with meats, cheese or vegetables, especially chilies. Preparation is complex, time-consuming and an excellent example of Mexican communal cooking, where this task usually falls to the women. Tamales are a favorite comfort food in Mexico, eaten as both breakfast and dinner, and often accompanied by hot atole or champurrado and arroz con leche (rice porridge, lit. rice with milk) or maize-based beverages of indigenous origin. Street vendors can be seen serving them from huge, steaming, covered pots (tamaleras) or ollas. The most common fillings are pork and chicken, in either red or green salsa or mole. Another traditional variation is to add pink-colored sugar to the corn mix and fill it with raisins or other dried fruit and make a sweet tamal de dulce. Commonly, a few "deaf", or fillingless, tamales (tamales sordos), might be served with refried beans and coffee. Most recently the roasted pepper and Monterey Jack cheese (chile con queso) tamales have become a favorite recipe. The cooking of tamales is traditionally done in batches of tens or sometimes hundreds, and the ratio of filling to dough (and the coarseness of the filling) is a matter of preference. In the North, after boiling, tamales are sometimes fried before serving, to give them a crunchy crust. In Michoacán (a Pacific coast state), a corunda is a tamale served bathed in sauce, cream, and salty cheese. Instead of corn husks, banana or plantain leaves are used in tropical parts of the country, such as Oaxaca, Chiapas, Veracruz, and the Yucatán Peninsula. These tamales are rather square in shape, often very large—15 inches (40 cm)—and these larger tamales are commonly known as "pibs" in the Yucatán Peninsula. Another very large type of tamale is zacahuil, made in the Huasteca region of Mexico. Depending on the size, zacahuil can feed anywhere between 50 and 200 people; they are made during festivals and holidays, for quinceañeras, and on Sundays to be sold at the markets. Another less-common variation is to use chard or avocado leaves, which can be eaten along with the filling. Tamales became one of the representatives of Mexican culinary tradition in Europe, being one of the first samples of the culture the Spanish conquistadors took back to Spain as proof of civilization, according to Fray Juan de Zumárraga. Tamales are usually eaten during festivities such as Christmas, the Day of the Dead, Las Posadas, La Candelaria Day (February 2) and Mexican Independence Day. Salvadorean tamales are made in banana or plantain leaves, and the masa (corn meal) is often seasoned with chicken stock. 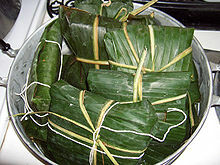 In Belize, El Salvador, Guatemala, Costa Rica, Honduras, Nicaragua, and Panama, tamales are also wrapped in plantain leaves. The dough is usually made from dent corn, not sweet corn. During the Christmas holidays, tamales made with corn flour are a special treat for Guatemalans and Hondurans. The preparation time of this type of tamale is long, due to the amount of time required to cook down and thicken the flour base. Guatemalan cuisine is known in particular for its hundreds of varieties of tamales; some popular ones include tamales de gallina (chicken), tamales dulces (sweet), and tamales de elote (in Costa Rica, this name can also refer to a type of corn pastry). In Guatemala, a variety of tamales is called tamales colorados, which have chicken or pork filling and a tomato-based sauce (recado), hence the colorado, which means 'to blush'. Tamales colorados may also contain olives, red bell pepper, prunes or raisins, capers, and almonds. The tamale is a staple in Belize, where it is also known by the Spanish name bollo or dukunu, a green corn tamale. Nicaragua has a large form known as nacatamales. Unlike other tamale recipes, the meat is added raw and cooked in the dough. In Panama, where they are considered one of the main national dishes, tamales are fairly large. The most common fillings are chicken, raisins, onions, tomato sauce, and sometimes sweet peas. Pork is also used. Another variation is tamal en olla, or tamal in pot, which simply is the tamale mixture, not wrapped in either plantain or banana leaves, and served directly from the pot onto plates. Tamales are usually served for all special occasions, including weddings and birthday parties, and are always found on the Christmas dinner table. Tamales in Costa Rica vary according to region and season. One sort of tamales, tamales mudos (mute tamales) is a tamale with no filling. Sweet tamales are popular during Holy Week. Tamales can be bought year-round, but the best tamales are, of course, home-made and not store-bought. It is a Christmas tradition in many families to gather and make dozens of tamales. They are wrapped in banana or plantain leaves, and then two are tied together with twine or string to keep water from seeping into the leaves. This pair is called a piña. Tamales are typically served on the inner leaf wrapping with Salsa Lizano, a locally prepared Worcestershire-type sauce. One version of tamales, called humita, is found in Argentine Northwest , Colombia, parts of Brazil, Chile, Ecuador, Bolivia and Peru. It can be either savoury or sweet. Sweet ones have raisins, vanilla, oil, and sugar; salty ones can be filled with cheese (queso fresco) or chicken. Tamales are found in northwestern Argentina (the provinces of Jujuy, Salta, Catamarca and Tucumán). Tamales salteños are made with shredded meat of a boiled lamb or pork head, and corn flour wrapped in chalas. Tamales jujeños use minced meat, corn and red peppers. Ecuadorian humitas can be filled with fresh cheese, pork, chicken or raisins, and they are usually wrapped in corn husk or achira (canna) leaves. Humitas are cooked in the oven or in the pachamanca. They are not tamales by Peruvian standards. In Chile, the food known as humitas is almost identical to tamales. In Peru and Bolivia the tamales tend to be spicy, large and wrapped in banana leaves. In Lima, common fillings are chicken or pork, usually accompanied by boiled eggs, olives, peanuts or a piece of chili pepper. In other cities, tamales are smaller, wrapped in corn husks and use white instead of yellow corn. In Brazil, a similar food is called "pamonha", but is more similar to the humita than the tamale, and has different origins. 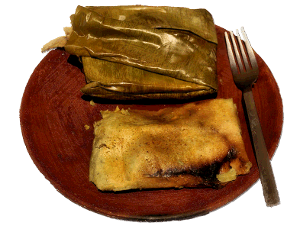 In Venezuela, another variant similar to tamale is called hallaca, which is also a popular dish in Ecuador. They are wrapped in plantain leaves and filled with a stew that may contain beef, chicken, pork, almonds, raisins and olives. They are traditionally eaten for Christmas. Also, the Venezuelan bollos are similar to tamales, wrapped in corn husks, filled with hot peppers or plain, and eaten as a side dish. In Colombia, they are wrapped in plantain leaves. The several varieties include the most widely known tolimense, as well as boyacense and santandereano. Like other South American varieties, the most common are very large compared to Mexican tamales — about the size of a softball — and the dough is softer and wetter, with a bright yellow color. A tamal tolimense is served for breakfast with hot chocolate, and may contain large pieces of cooked carrot or other vegetables, whole corn kernels, rice, chicken on the bone and/or chunks of pork. Related foods are the envuelto and bollo limpio which are made of corn, cooked in a corn husk, and resemble a Mexican tamale more closely but have simpler fillings or no filling at all for they are often served to accompany various foods, and the bollo de yuca made of yuca flour, also cooked in a corn husk, eaten with butifarra and sour milk (known in the country as suero costeño). A tamal dulce breakfast tamal from Oaxaca, Mexico. It contains pineapple, raisins and blackberries. In Cuba, before the 1959 Revolution, street vendors sold Mexican-style tamales wrapped in corn husks, usually made without any kind of spicy seasoning. Cuban tamales being identical in form to those made in Mexico City suggests they were brought over to Cuba during the period of intense cultural and musical exchange between Cuba and Mexico, between the 1920s and 2000s. A well-known Cuban song from the 1950s, "Los Tamalitos de Olga", (a cha-cha-cha sung by Orquesta Aragón) celebrated the delicious tamales sold by a street vendor in Cienfuegos. A peculiarly Cuban invention is the dish known as tamal en cazuela, basically consisting of tamale masa with the meat stuffing stirred into the masa, then cooked in a pot on the stove to form a kind of hearty cornmeal porridge. In Dominican Republic, they are called pasteles en hoja, and they are traditionally (but not exclusively) eaten for Christmas. The dough is usually made from plantains, although sometimes cassava is used as well; the meat filling is typically ground beef, but chicken and pork is also common. They are wrapped in plantain leaves, bound with twine, and steamed. In Santo Domingo, some eateries sell them, as well as street vendors. They are especially popular in the nearby city of San Cristobal. In Trinidad and Tobago, it is called a pastelle and is associated almost entirely with Christmas. Raisins and capers along with other seasonings are added to the meat filling. The entire thing is wrapped in a banana leaf, bound with twine and steamed. The sweet version is called paymee. On Curaçao, Bonaire and Aruba, it is called "Ayaka" in Papiamento. The name is derived from the Venezuelan "Hallaca". It is usually eaten with Christmas. They are made with corn meal and there are different kinds of filling, usually consisting of a tomato based sauce with meat such as chicken, tuna or beef. Fruits, nuts, capers, olives, etc. can be added depending on family recipes and kind of meat used. The Ayakas are usually wrapped in banana leaves. Tamales have been eaten in the United States since at least 1893, when they were featured at the World's Columbian Exposition. A tradition of roving tamale sellers was documented in early 20th-century blues music. They are the subject of the well-known 1937 blues/ragtime song "They're Red Hot" by Robert Johnson. Delta-style tamales from Clarksdale, Mississippi. While Mexican-style and other Latin American-style tamales are featured at ethnic restaurants throughout the United States, there are also some distinctly indigenous styles. Choctaw and Chickasaw make a dish called Banaha which can be stuffed or not (plain) usually the filling (range from none, fried bacon, turkey, deer, nuts, and vegetables like onions, potatoes, squash, and sweet potatoes) can either be filled or mixed with the masa and steamed in a corn shuck. Cherokee tamales, also known as bean bread or "broadswords", were made with hominy (in the case of the Cherokee, the masa was made from corn boiled in water treated with wood ashes instead of lime) and beans, and wrapped in green corn leaves or large tree leaves and boiled, similar to the meatless pre-Columbian bean and masa tamales still prepared in Chiapas, central Mexico, and Guatemala. In the Mississippi Delta, African Americans developed a spicy tamale made from cornmeal (rather than masa), which is boiled in corn husks. In northern Louisiana, tamales have been made for several centuries. The Spanish established presidio Los Adaes in 1721 in modern-day Robeline, Louisiana. The descendants of these Spanish settlers from central Mexico were the first tamale makers to arrive in the eastern US. Zwolle, Louisiana, has a Tamale Fiesta every year in October. In Chicago, unique tamales made from machine-extruded cornmeal wrapped in paper are sold at Chicago-style hot dog stands. 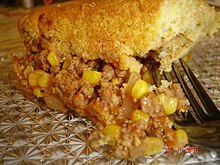 Around the beginning of the 20th century, the name "tamale pie" was given to meat pies and casseroles made with a cornmeal crust and typical tamale fillings arranged in layers. Although characterized as Mexican food, these forms are not popular in Mexican American culture in which the individually wrapped style is preferred. The Indio International Tamale Festival held every December in Indio, California has earned two Guinness World Records: the largest tamale festival (120,000 in attendance, Dec. 2–3, 2000) and the world's largest tamale, over 1 foot (0.3 m) in diameter and 40 feet (12.2 m) in length, created by Chef John Sedlar. The 2006 Guinness book calls the festival "the world's largest cooking and culinary festival." 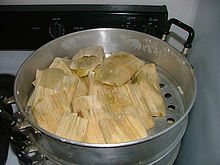 In the Philippines and Guam, which were governed by Spain as a province of Mexico, different forms of "tamales" exist. Some are made with a dough derived from ground rice and are filled with seasoned chicken or pork with the addition of peanuts and other seasonings such as sugar. In some places, such as the Pampanga and Batangas provinces, the tamales are wrapped in banana leaves, but sweet corn varieties from the Visayas region are wrapped in corn husks similar to the sweet corn tamales of the American Southwest and Mexico. Because of the work involved in the preparation of tamales, they usually only appear during the special holidays or other big celebrations. Various tamal recipes have practically disappeared under the pressures of modern life and the ease of fast food. Several varieties of tamales are also found in the Philippines. Tamales, tamalis, tamalos, pasteles, are different varieties found throughout the region. Some are sweet, some are savory, and some are sweet and savory. Mostly wrapped in banana leaves and made of rice, either the whole grain or ground and cooked with coconut milk and other seasonings, they are sometimes filled with meat and seafood, or are plain and have no filling. There are certain varieties, such as tamalos, that are made of a sweet corn masa wrapped in a corn husk or leaf. There are also varieties made without masa, like tamalis, which are made with small fish fry wrapped in banana leaves and steamed, similar to the tamales de charal from Mexico, where the small fish are cooked whole with herbs and seasonings wrapped inside a corn husk without masa. The number of varieties have unfortunately dwindled through the years so certain types of tamales that were once popular in the Philippines have become lost or are simply memories. The variety found in Guam, known as tamales guiso, is made with corn masa and wrapped in corn husks, and as with the Philippine tamales, are clear evidence of the influence of the galleon trade that occurred between the ports of Manila and Acapulco. ^ "tamale - English-Spanish Dictionary - WordReference.com". www.wordreference.com. Retrieved 2016-02-26. ^ a b Daniel., Hoyer (2008). Tamales (1st ed.). Salt Lake City, Utah: Gibbs Smith. ISBN 9781423603191. OCLC 199465927. ^ William A. Saturno, Karl A. Taube and David Stuart 2005 The Murals of San Bartolo, EI Peten, Guatemala, Part 1: The North Wall. Ancient America, Number 7. Center for Ancient American Studies, Barnardsville, NC. ^ "Real Academia Española". www.dle.rar.es. Retrieved 2018-04-08. ^ "Origin and Meaning of Tamale". Online Etymology Dictionary. Retrieved 25 November 2018. ^ Manuel., Aguilar-Moreno (2007). Handbook to life in the Aztec world. Oxford: Oxford University Press. ISBN 9780195330830. OCLC 81150666. ^ LeCount, Lisa J. (December 2001). "Like Water for Chocolate: Feasting and Political Ritual among the Late Classic Maya at Xunantunich, Belize". American Anthropologist. 103 (4): 935–953. doi:10.1525/aa.2001.103.4.935. ^ Staller, John Edward; Carrasco, Michael (2010). Pre-Columbian Foodways: Interdisciplinary Approaches to Food, Culture, and Markets in Ancient Mesoamerica. New York: Springer. pp. 349–354. ISBN 978-1-4419-0470-6. ^ Taube, K. A. (1989). The maize tamale in Classic Maya diet, epigraphy, and art. American Antiquity, 54(1), 31-51. ^ Zizumbo-Villarreal, D., Flores-Silva, A. & Colunga-García Marín, P. (2012). The Archaic Diet in Mesoamerica: Incentive for Milpa Development and Species Domestication. Economic Botany, 66(4), 328-343. ^ Lawson Gray, Andrea (Jan 28, 2016). "Mexican foodways: Tamales and Candlemas". My Mission: Tastes of San Francisco. wordpress. ^ "Mexican tamale called the zacahuil is three feet long". Puerto Vallarta News. 2014-09-15. Retrieved 2017-07-26. ^ Ken Albala (31 May 2011). Food Cultures of the World Encyclopedia: [Four Volumes]. ABC-CLIO. p. 34. ISBN 978-0-313-37627-6. Retrieved November 20, 2012. ^ Three Guys From Miami. "Cuban Tamal en Cazuela". Three Guys From Miami. Retrieved 27 January 2017. ^ Ken Albala (25 May 2011). Food Cultures of the World Encyclopedia. ABC-CLIO. p. 300. ISBN 978-0-313-37626-9. Retrieved 4 August 2012. ^ a b c d Zeldes, Leah A. (Dec 18, 2009). "The unique Chicago tamale, a tuneful mystery". Dining Chicago. Chicago's Restaurant & Entertainment Guide, Inc. Retrieved Dec 18, 2009. ^ "Hot Tamale Trail – Tamales in the Mississippi Delta". Tamaletrail.com. 2011-08-26. Retrieved 2013-12-15. ^ All Things Considered. "Tamales, Another Treat from the Delta". Npr.org. Retrieved 2013-12-15. ^ Zanger, Mark H. (May 1, 2007). "Tamale pie". In Andrew F. Smith (ed.). The Oxford Companion to American Food and Drink. Oxford University Press. p. 581. ISBN 978-0-19-530796-2. Retrieved December 27, 2012.